CUMIN LASSI - Lassi is a very popular drink in India.It can be prepared in two version either salty or sweet. 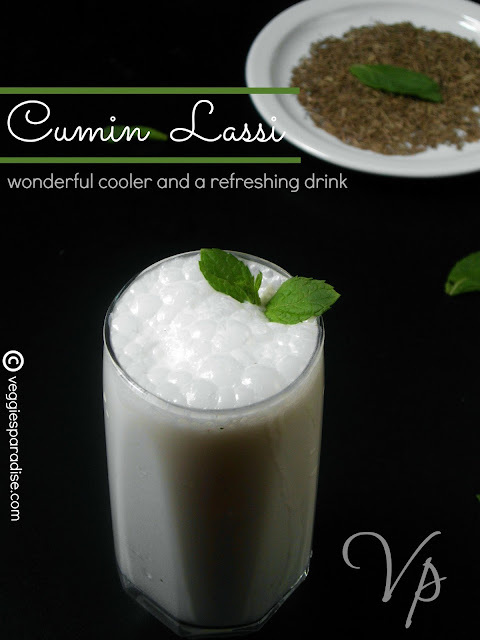 Cumin Lassi is an excellent thirst quencher to have during summer. Extremely easy to prepare this drink is made with buttermilk and adding cumin powder gives a distinctive flavor. 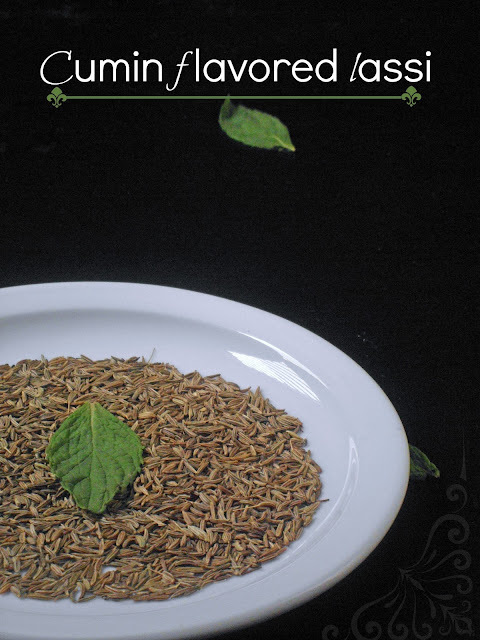 For cumin powder, heat a small pan and dry roast the cumin seeds until browned and a nice aroma comes from it. Blend the roasted cumin seeds until smooth, now your cumin powder is ready, store it an airtight container and use it for the recipes that calls for it. Mix the cumin powder with buttermilk along with 1 cup of water , salt,stir it well and serve in tall glasses garnished with mint sprigs. Add ice cubes,if you like the lassi a little colder. love the aroma of cumin in buttermilk..nice clicks..
Ahhaa thirst quenched here loved the frothing on top. too great a presentation for sucha a simple n quick drink. Love the cumin flavor in lassi. These days I am making it often to cool myself. nice cliks n luks very refreshing..